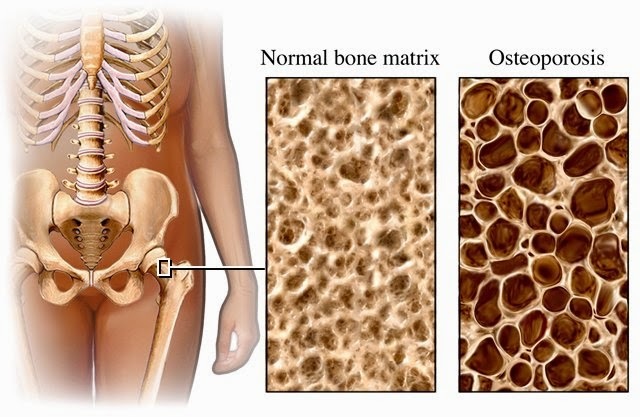 Osteoporosis means porous bone, is a skeletal disease that results low bone mass and make it weaker than normal. Osteoporosis will increase risk of bone fractures especially in hip, spine, and wrist. Light accident taking by osteoporosis sufferer can results fracture that hard to recovered. American National Institute said that osteoporosis is accountable for 1.5 millon fractures in the states each year. There are some factors causing osteoporosis, such as age, gender, body frame and weight, menopause, low testosterone level, and inadequate intake of calcium and vitamin D. Old peoples more easy to suffer osteoporosis because of degradation process in their bones. Menopause is one of the most common condition resulting osteoporosis. Calcium and vitamin D very important to maintain bone health, inadequate intake it will result osteoporosis in any age. Prevention of osteoporosis is important to free from the risks. Eating healthy diet and exercise is need to building strong bones. Diet rich of calcium and vitamin D will ensure bones to be health and strong if combinated with exercise. Calcium is deposited in the bones and making hard and strong structure, yet absorbtion of calcium is promoting by vitamin D. Human bones growing stronger and bigger in response to weight-bearing exercise. People who never take exercise have smaller and weaker bones than one who regularly take exercise. We can test bone density with DEXA scans, are easy, fast, and painless process. The test uses X-rays to detect amount of calcium and other mineral in the bones. Old peoples are more threatened by osteoporosis, so recommended to take the test as early as possible. Screening for osteoporosis recommended to women older than 65 and for man older than 70. If the test shows that you are positive of osteoporosis you can contact the doctor to ask some advices.